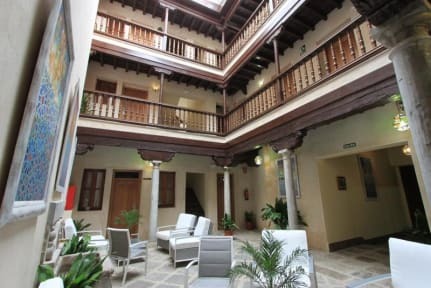 Hostel Casa Mercader de Sedas, Granada, Hiszpania : Rezerwuj teraz! Avoid this place, it's clear that the owners of this hostel don't do any efforts to make the stay a nice experience. They know there are many tourist coming to Granada anyway, so they just don't care - the staff is unpleasant, many things don't work properly, fridges stink and are filthy in general, wifi in the room almost doesn't work, one working socket for 10 people dorm (which was marketed as "luxurious room with private bathroom", it's a joke) and they let totally drunk people in.